WattHead - Energy News and Commentary: The Real Policy Lesson From the Chinese Wind Turbine "Scare"
The Real Policy Lesson From the Chinese Wind Turbine "Scare"
Outcry over a planned Texas wind farm, which will be the first project to import wind turbines from a Chinese manufacturer, has resulted in calls to prevent government stimulus money from funding the project. As Bloomberg reported, in a letter to U.S. Energy Secretary Steven Chu, Senator Charles Schumer insisted that funding only be granted to U.S. manufactured turbines. "I urge you to reject any request for stimulus money unless the high-value components, including the wind turbines, are manufactured in the United States...China is fast emerging as one of our main rivals in the race to build the technology that can help us achieve energy independence. We should not be giving China a head start in this race at our own country's expense." But those expressing alarm that money from the stimulus package will accrue to China are forgetting that importing wind turbine components is actually nothing new in the United States. In fact, this story broke at almost that same time that a new investigative report by the American University School of Communication revealed that 84% of the U.S. stimulus money for renewable projects has been given to overseas companies. It is certainly symbolic that this project, which is being carried out by a consortium of Chinese and American companies, will be built with the first wind turbines imported from China. Yet, imported wind turbine components made up about 50% of installed capacity this year, with parts largely being exported from Europe. General Electric (GE) is the only American company represented among the top five wind component manufacturers in the world. As long as the U.S. lags in domestic turbine manufacturing, and as long as wind projects need turbines, it is inevitable that the parts for these efforts will be sourced from the foreign market. "Why aren't American firms building this clean-energy project? The reason for the lack of American presence in wind turbine manufacturing is clear: inconsistent government investment and public policy support. Prior to 2006, the U.S. production tax credit (PTC) for wind installations expired on an almost annual-basis before eventual reinstatement, leading to a boom-bust domestic market that created crippling investor uncertainty and prevented major investments in U.S. manufacturing capacity. In contrast, Denmark's Vestas became the world leader in wind turbine manufacturing with the crucial support of consistent, long-term public investment from the Danish government. The same situation is true for Germany's Siemens and Spain's Gamesa, where feed-in tariff policies provide strong and consistent support for domestic markets as well as investor certainty for manufacturing and technology companies. 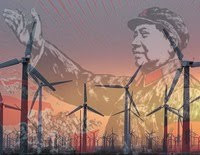 The same story is now taking shape in China, where new guaranteed wind tariff prices have been launched and the Chinese government has provided direct support for China's turbine manufacturers. The good news for the U.S. is this: the share of foreign-manufactured turbine components used in U.S. wind farms has been falling - we imported 70% of components in 2005, compared to the 50% today. This improvement is due to the instatement in 2006 of a long-term production tax credit (PTC) that, thanks to subsequent extensions, will now remain in force through the end of 2012. And as our European competitors have shown, leadership in wind turbine manufacturing has far less to do with the price of labor than it does with sustained and effective public policy support. After all, EU labor prices hardly offer an inherent comparative advantage over the U.S., let alone over Chinese or Indian wind competitors. Now, with relatively consistent public policy support finally in place - at least for the next few years - there has been a subsequent increase in investment in U.S. manufacturing capacity. Still, with U.S. wind companies long lagging behind their foreign competitors, much of this new investment comes as leading foreign companies like Vestas, Siemens, and Gamesa all open U.S. manufacturing sites. To be certain, that means more U.S. jobs and foreign investment - both good for the faltering U.S. economy. But ensuring American leadership in the burgeoning global wind market will clearly require significant, long-term public investment and support for both domestic markets and U.S. manufacturing. After years of negligence, getting ahead in the clean energy race won't be easy. Senator Schumer and others who seek to bar Chinese manufacturers from stimulus funds are missing the point. Keeping foreign companies from stimulus funding is a misplaced effort to treat the symptom not the problem. If the U.S. policy environment continues to focus on short-term measures to spur demand, we will consistently see investment accrue to foreign imports. If we want domestic manufacturers to supply the technology to meet our clean energy needs, the U.S. needs both long-term support for manufacturing capacity as well as consistent, targeted deployment incentives to create a stable domestic market. Equally important in the long-run will be large investments in research and innovation that can secure U.S. technological leadership and ensure the next generation of clean energy technologies are invented and commercialized here in the U.S.
Until the U.S. gets serious about a coordinated, consistent, and aggressive package of policies supporting U.S. clean energy innovation, manufacturing and markets, we will continue to see short-term bursts of funding, like the stimulus-funded cash grant program, end up invested in foreign innovation and technology.